The Schultüte tradition goes back to the early 1800s in Germany. 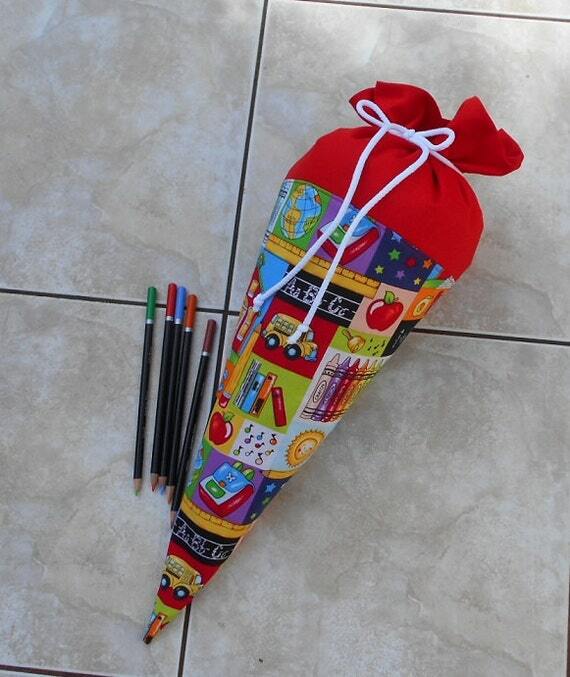 On their first day of school, children traditionally receive a cone shaped bag or “Tüte” filled with treats and toys, to make starting real school just a little bit sweeter. 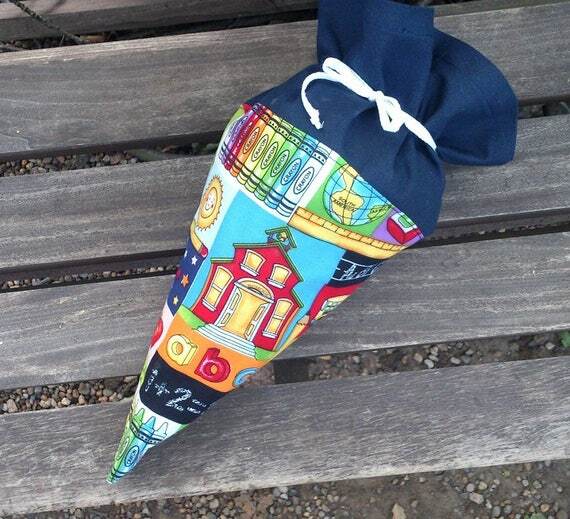 Before the beginning of the School Year in Germany, the stores are filled with a variety of cones… both filled and unfilled… for parents to buy. But here in the USA, the tradition hasn’t quite caught on. Still, there are plenty of German School Cones to buy and fill online. And you can find them in a rainbow of colors, or even with a theme matching your child’s personality and favorites! With the beginning of school just around the corner, unless you are crafty enough to make your own, you might want to order one soon! 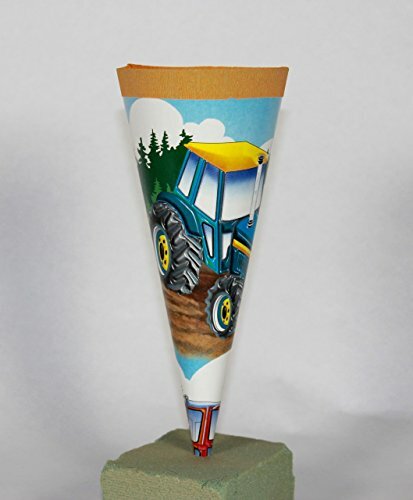 The Schultüte or School cone became part of German culture in the early 1800s. 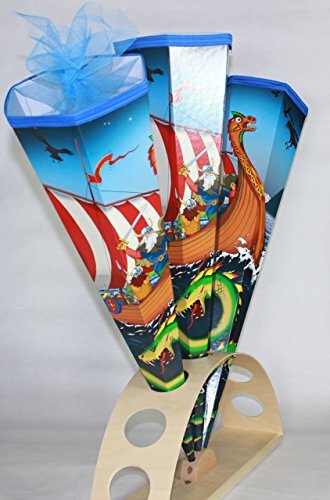 At the time, the cone was just the paper cone you would get from the store when you bought sweets… twisted at the top, and filled with sugary treats. The idea was two-fold. First, it marked the special moment when a child would leave Kindergarten and day care, to go on to real school. They were no longer “babies”…it was a change in status. Second, it made this HUGE life-changing event a little sweeter. In the early days, there would be a metal or wooden “Tree” at the school. Parents or God-parents would take the Schultüte, marked with their child’s name to school the night before, and hang it from the tree. 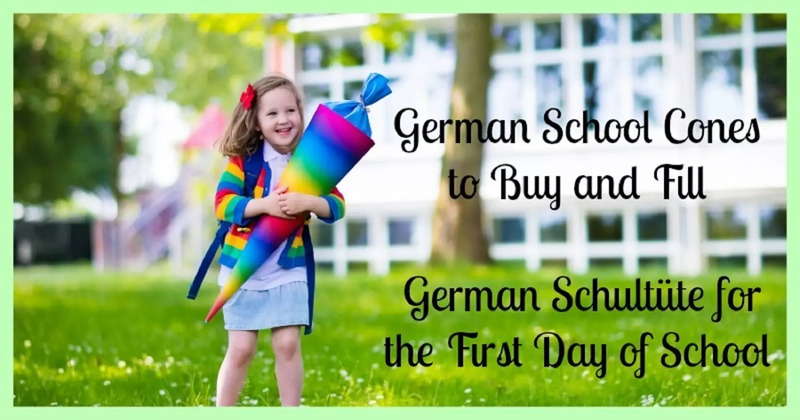 On the first day of school, kids were told that there is a Schultütebaum at school, and if they are big enough to pick it, they are big enough to attend school. Today, it is still common for grandparents and godparents to buy the Schultüte, but they seldom get hung from trees… and usually, they are filled with practical gifts like crayons, school supplies, little toys or CDs… but still, there is often something sweet inside too. Often parents will hang the Schultüte from the child’s bedroom door…. I love early Schultüte Tradition. It all began in Saxony and Thuringa in around 1815, and spread to cities and towns across Germany rather quickly. 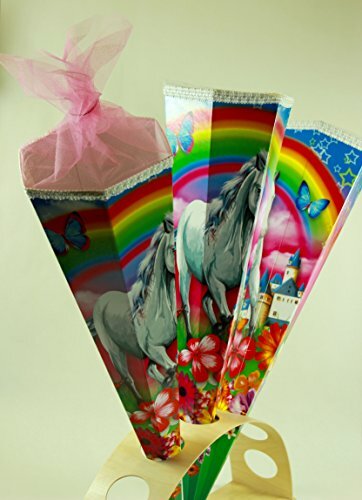 Grandparents or Godparents would fill a Schultüte or Cone Shaped bag with sweets, label it with the child’s name, and hang it from a metal or wooden Schultüte Tree outside the school. The children would then find theirs, and take it down carefully… without breaking it! 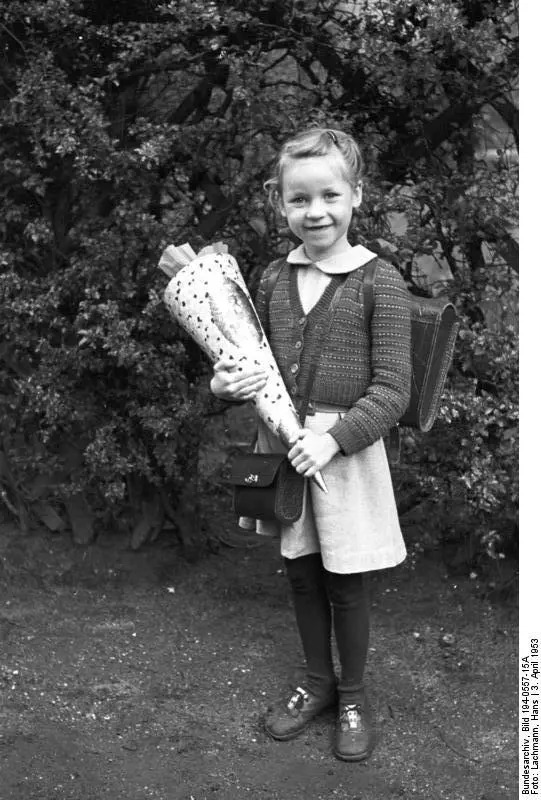 If the Schultüte was ripe for picking, and the child was big enough to claim it, then he or she would be ready to start school. One thing to note, the Schultüte is not opened at school. It opened at home. The meant that even in times of War or depression, a child could still get a cone, and it would be filled with something, but it might not be sweets or treats… it could be something more practical. And no one else would have to know what was inside. Still, they GOT a school cone. And that was the important part. 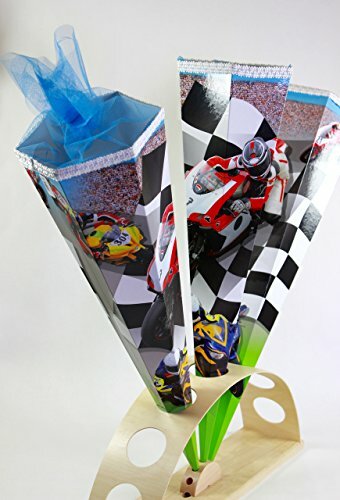 Today, like Christmas and Easter, some parents go crazy filling the school cones with all sorts of toys and game… as well as sweets and school supplies. Other parents keep it more simple. It’s up to the parent to decide what they feel is right. I see the Schultüte is a lovely tradition. Marking the time when a child leaves Kindergarten and moves on to Real School makes a wonderful memory. It doesn’t have to be extravagant! A few candies, and some essential school supplies great way to celebrate! Do you want to incorporate the German Schultüte into your family tradition? You can find the cones below. 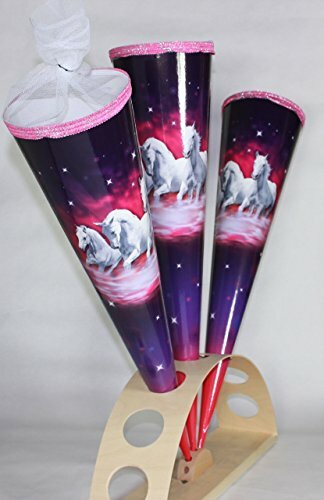 While you can buy a German school cones already filled with treats, there are many more fabric or paper cones that come un-filled. These can be used later for play or storage. 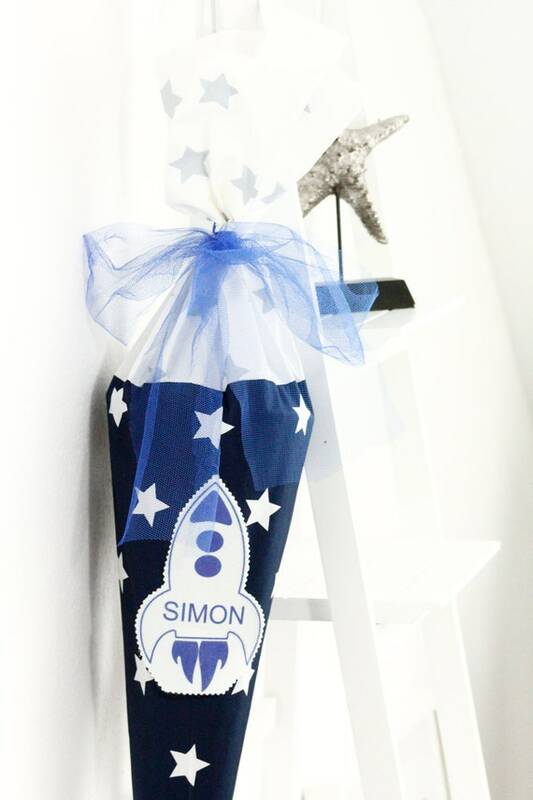 Take a look, I’m certain you will find the perfect Schultüte for your little one. These can be used for the first day of school… and then after that for holding toys or art supplies. 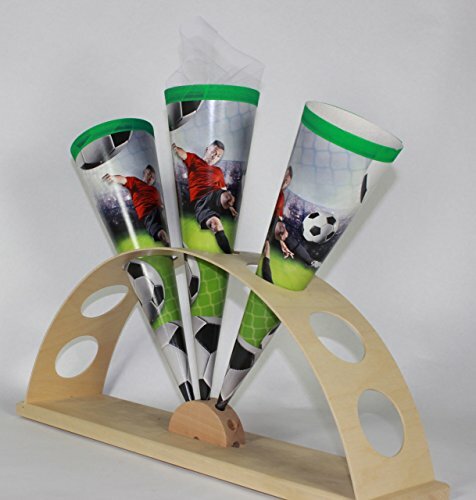 Paper Cones cost a lot less than fabric, and they come in a variety of sizes and colors. 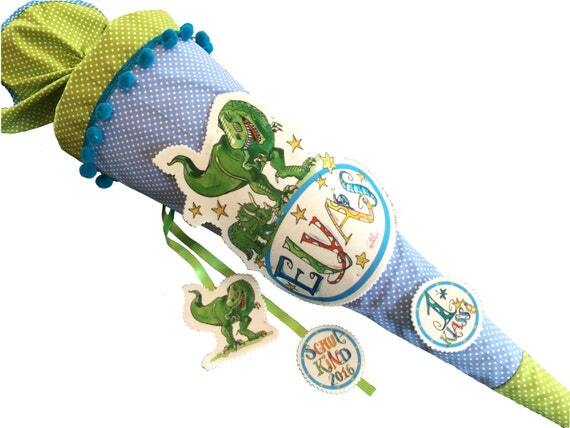 Is your little one in to dinosaurs or princesses? Polka dots or…… I’m sure you will find the perfect Schultuete HERE. These little cones are small… measuring just 9″ long with a 3 1/2″ diameter opening. Perfect for a few treats like pencils and candy. The medium ones are a bit bigger, 14″ long with a 4″ opening, so a few more treats will fit inside. These cones are made from study cardboard, and have a mesh opening at the top. 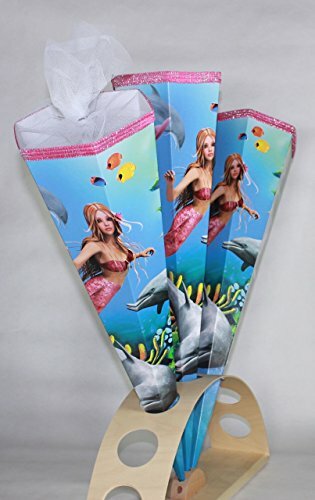 They are around 27″ long and have a 7″ opening at the top… perfect for loading up with goodies and school supplies! They come in smooth round or hex-shaped opening. 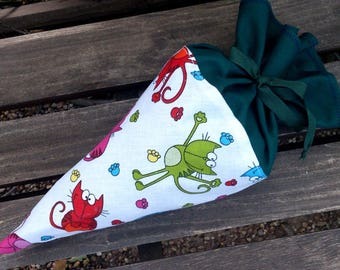 These fabric school cones make a wonderful and lasting gift. Not only are they nice to look at and hold, they can be hung up later to use as toy storage. Some can even be handed down to the next generation. These little cones hold sweets and supplies, and later, you can do what my little cousins did… hang them on the door knobs to store things like pencils or crayons. These larger Schultüte hold a lot of supplies! And many can even be personalized! Just be sure to get that order in early. They are great for storing toys after they are emptied, and some can be used as a “sleep-away” pillow! Just fill with stuffing and close the top. The fabric cones will hold up to a lot more handling than the paper ones. 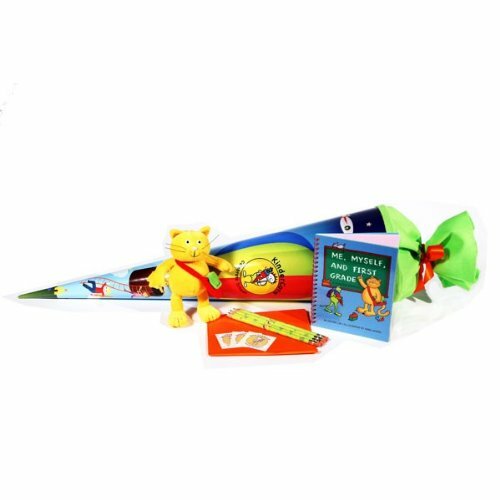 You can buy a German School Cone that is already filled… this medium sized cone has a stuffed animal, a book, pencils and some stickers. 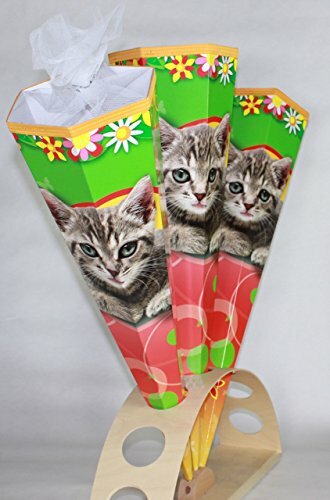 It’s cute and fun, and a pre filled cone is easy to gift! 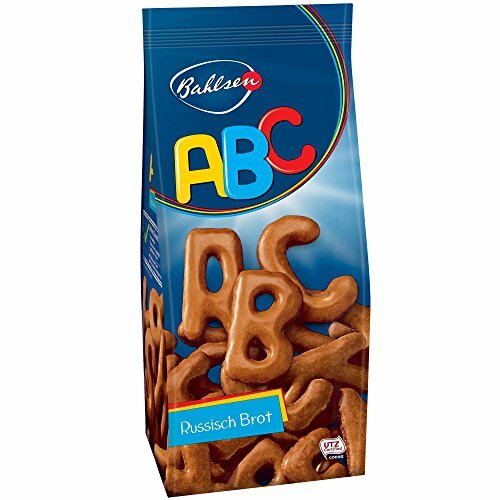 The PERFECT Schultüte Filler! Russisch Brot! These Alphabet cookies go very well in a School cone… and they aren’t too sweet! Get back to school with Smarties, Alphabet Gummies, Candy Blox, Dum Dums, Nerds, Apple Taffy, and other fun candy favorites with Easy Checkout and $9.95 Flat Rate Shipping at ACandyStore – Buy in Bulk and Save Now! Hi there! Maker of the WyseWorks Schultüten here. Thank you so much for the mention! My kids love this tradition, too! They would prefer a new Schultüte every year. And the photos ares SO fun! They also make for fun comparisons between the generations! You are quite welcome Jill… I’d love it if the Schultüte took off here too! I loved “basteling” cones for both my children, and will never throw them away, all these years on. Wonder how to re-purpose them? !